Although it has many different names, the Five Books of Moses are the most central origin texts for the whole of Judaism and Jewish life. Pentateuch (πεντάτευχος): This is the Greek name, which means "five scrolls." Torah (תּוֹרָה): Although Judaism has both a Written Torah and an Oral Torah, the term "Torah," meaning "to guide/teach" is used across the board to refer to the first five books of the greater Jewish canon known as Tanakh, which is an acronym for Torah, Nevi'im (prophets), and Ketuvim (writings). The origin for this comes from Joshua 8:31-32, which references the "book of the law of Moses" (סֵפֶר תּוֹרַת מֹשֶׁה, or sefer torah Moshe). It appears in many other places, including Ezra 6:18, which calls the text the "Book of Moshe" (סְפַר מֹשֶׁה, sefer Moshe). Although there is plenty of controversy over the authorship of the Torah, in Judaism, it is believed that Moses was responsible writing the five books. Genesis, or Bereishit (בְּרֵאשִׁית): Bereishit means "in the beginning, and this is the Hebrew word that kicks off the five book narrative of the Israelite nation. Exodus, or Shemot (שְׁמוֹת): Shemot means "names" in Hebrew. Exodus starts by naming the 11 tribes that went with Jacob into Egypt: "And these are the names of the sons of Israel who came to Egypt; with Jacob, each man and his household came: Reuben, Simeon, Levi, and Judah. Issachar, Zebulun, and Benjamin. Dan and Naphtali, Gad and Asher. Now all those descended from Jacob were seventy souls, and Joseph was in Egypt." Leviticus, or Vayikra (וַיִּקְרָא): Vayikra means "And He called" in Hebrew. This book begins with God calling for Moses. God then relays that Moses should share with the Israelites the bulk of the laws and the services of the Levites and the Priests or Kohanim. Among the many laws told are those of sacrifices; forbidden relationships; the major holidays of Passover, Shavuot, Rosh Hashanah, Yom Kippur, and Sukkot; and more. Numbers, or BaMidbar (בְּמִדְבַּר): BaMidbar means "In the wilderness" in Hebrew. This book chronicles the Israelites' journey through the wilderness after the Exodus from Egypt. Deuteronomy, or Devarim (דְּבָרִים): Devarim means "words" in Hebrew. Devarim has Moses chronicling and retelling the journey of the Israelites as he prepares to die without entering the Promised Land. At the end of Devarim, Moses dies and the Israelites enter the land of Israel. In Judaism, the Five Books of Moses are traditionally recorded in scroll form. This scroll is used weekly in synagogues in order to read the weekly Torah portions. 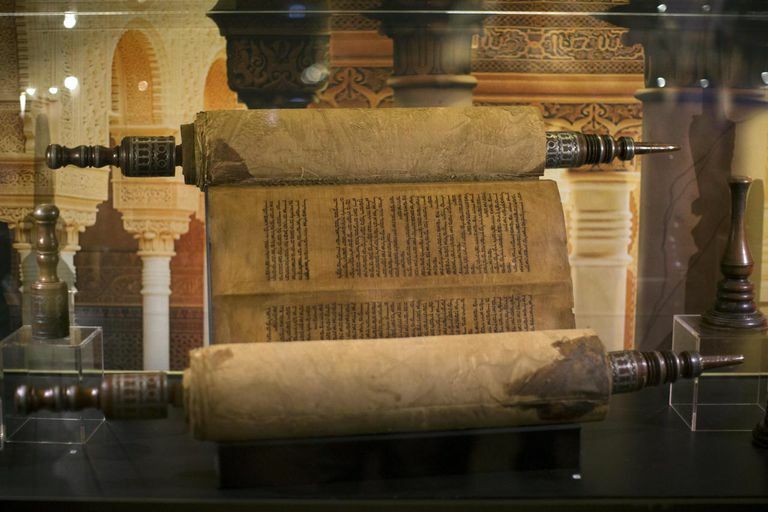 There are countless rules surrounding the creation of, writing of, and use of a Torah scroll, which is why the chumash is popular in Judaism today. The chumash essentially is just a printed version of the Five Books of Moses used in prayer and study. Residing at the University of Bologna for decades, the oldest copy of the Torah is more than 800 years old. The scroll dates to between 1155 and 1225 and includes complete versions of the Five Books of Moses in Hebrew on sheepskin.